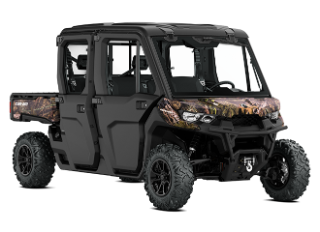 The Defender MAX XT CAB is the most complete utility vehicle that is inspired by those who drive it. Tough, capable and clever features allow the Defender MAX XT CAB to get the most out of your workday in comfort, style and ingenuity. Full cab enclosure with tilt up windshield and wiper kit, doors with electric opening windows in front (hinged window opening in rear) and rear window with sliding opening. Even when you’re working or hunting outside in colder climates, you can escape the bone-chilling temps by climbing into a toasty warm cabin and firing on the integrated heater. 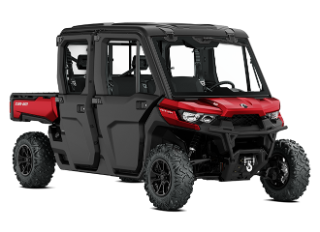 The 72-hp Rotax HD10 V-Twin is specifically tuned for serious work but also offers 61 lb-ft torque and peak torque at lower RPM for optimal delivery for recreational use. The Visco-Lok QE† front differential combined with the lockable rear differential offer a 4-mode traction system providing multiple choices for varying terrain or tasks. Users, via a separate front-and-rear toggle switches, can select between a 2x4 open rear differential for tight turning and turf protection, a 2x4 lockable rear for improved 2WD traction, a 4x4 open rear for more maneuverability in rugged terrain and a 4x4 locked rear for maximum traction. The rear differential is gear-on-gear to the transmission for better response, no maintenance, better efficiency and fewer components. The VERSA-PRO bench seat offered on the XT package includes a reinforced seat cover. It uses a thicker vinyl and a special material finish to be more resistant and offer a premium look. The Defender vehicles’ high-quality seat cover is designed to endure the everyday use on the farm, job site and trail. In addition, the XT VERSA-PRO bench seat comes with a 3-in (8 cm) adjustable driver’s seat (forward/rearward) for added comfort and better ingress/egress. The open dash design features a handy removable and water-resistant 1.7 gal (6.3 L) toolbox, an industry exclusive, to allow users to carefully carry tools and supplies their need in an organized manner. In addition, it includes under dash storage with an enclosed pocket, perfect for stowing small essentials. Combined with the removable and waterproof under seat storage box, the Defender MAX XT CAB proposes an impressive storage capacity of 14 gal (53 L). The Maxxis Bighorn 2.0 tires offer a smoother ride, predictable cornering and optimum climbing confidence. Installed on redesigned cast-aluminum wheels featuring a strong lightweight construction. 154.8 x 67 x 78 in.